Kendrapara(PTI): The mangrove forest cover in Odisha’s Bhitarkanika National Park has registered an impressive rise in mammal population. According to the latest head count report released by the forest department, the enumerators spotted 7,129 mammals of 14 species in Kendrapara district while the figure stood at 6,122 last year. 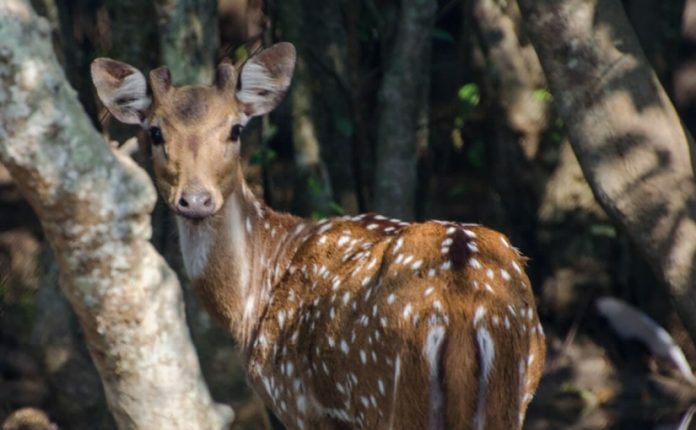 “There has been a substantial increase in mammal population in the park due to adequate conservation measures and vigil by anti-poaching squad of the forest department,” Bimal P Acharya, the Divisional Forest Officer (DFO), Bhitarkanika, said. Deer, wild boars and monkeys formed the sizable chunk of the numbers of mammals in Bhitarkanika. These itinerant species who stray into nearby human settlements on the close periphery of the park damage crop and agriculture fields, thus triggering man-animal conflict. Head count survey of mammals is being undertaken as general perception is that there is massive spurt in the number of spotted deer and wild boar. Growth in number has led animals to stray from habitation areas to hamlets lying on the close periphery of the park, wildlife activists say. The animals’ numbers are proportionate to their habitation corridors. Factors prompting the animals making their way to crop fields and orchards in village areas could also be analysed methodically on the census figures, said the DFO. The forest department conduct annual head count of estuarine crocodiles, winter migrant avian species, monsoon migrant water birds. Count is also made on the number of Olive Ridley turtles engaged in annual mass nesting at Gahirmatha beach. The Gahirmatha marine sanctuary comes under the administrative jurisdiction of the national park. From observation made in the past by wildlife staff, every year these mammals are increasing in number. A couple of factors are contributing to the rising graph. First, the rich and lush-green mangrove forest has turned out to be an ideal habitat for hyenas, boars and deer, the DFO said. Besides, lack of human interference in their habitation corridors has also emerged favourable. There is also imbalance in predator-prey base in Bhitarkanika. Unlike the Sundarbans, Bhitarkanika mangroves are devoid of tigers. Only the estuarine crocodiles prey upon these animals, B P Acharya said.